Last week was a week full of exams. Exams started 5th (yeah I know, I've said it a million times now) and on the first day, we had Buddhism (religion) and Japanese exams. Talking about it, the Buddhism paper was so easy. But the only problem was I was feeling too sleepy. Not just me, my friends were also yawning the whole time. But I was able to answer the paper actively. After the interval, we had Japanese papers. Only two students are learning Japanese in our class including me. The paper was easier than I thought but I had some trouble answering the 'bunka' (culture) part. 3 hours are given for the paper but I finished it in about 1 1/2 hours. The next day, we had a holiday because it was Deepavali for the Hindus. So I got ready for Math test which was on the next day. And also I didn't forget to go to bed earlier so that I won't be feeling sleepy. The first part of the Math paper was too easy but in the essay type questions, we were told to select 5 questions out of 6 in Part A and 5 out of 6 in Part B. But the thing is, I was only able to do 4 questions in Part B and there were 2 questions that I don't know. One was related to geometry and the other was related to volume and stuff. Then finally I decided to do the geometry questions and proved it telling this and that and finished the paper. When I was walking with my friend to the bus, we talked about that question and then I remembered the correct way of solving that problem. The next day, we had English language and Information Technology exams. The English paper was too easy and so did the I.C.T. paper. But I'm not sure of the MCQ paper of I.C.T. On Sunday we went to the Karate and Zumba class as usual. That day, we were trained for the Zumba show which will be held on 15th December. On Monday, we had Sinhala language and literature exam. Normally, the Literature paper is easier for me than the Sinhala language paper. I don't know why, but I always have trouble with the grammar paper. The next day, we had English literature exam. The whole paper was easy except the critic wee had to write on the novel 'Bringing Tony Home'. When I returned home, I was having a big headache and I was feeling like I'm having a cold. I tried to take a nap but I couldn't. My parents and sis went out that evening and I and bro were at home. Our brother went to bed and I got off of the bed and went to a chair with my History textbook cuz the next day, we were having History exam. My body was aching and I was feeling too cold and I felt like I'm having a fever.🤒🤒🤒 But I wanted to study some History stuff and so I kept staring at my book. After a while, I went back to bed and then my parents and sis came back home. Mom gave me a paracetamol and some spicy food. Then after having dinner, I fell asleep. The next morning mom woke me up and asked whether I can go to school or not. I told her that I couldn't skip the History exam and mom gave me some medics and I went to school. You know everything is forgotten when we are with friends. I almost forgot that I was having a fever when I was joking with my friends. I started to answer very quickly just when the paper was given and when I finished the paper, I kept my head on the table and fell asleep. Then when the MCQ paper was given, I did it so quickly within a half an hour. The History paper was the last paper for this year! Yeey! 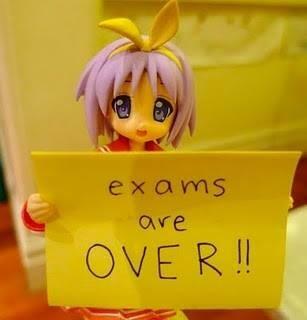 Exams are over!! !